The 2018 Bowman Chrome National Convention Wrapper Redemption set continues a long run of NSCC offerings from the legendary card company. The Topps promo supplies exclusive MLB cards to those who make specific box purchases at the 2018 National Sports Collectors Convention in Cleveland. 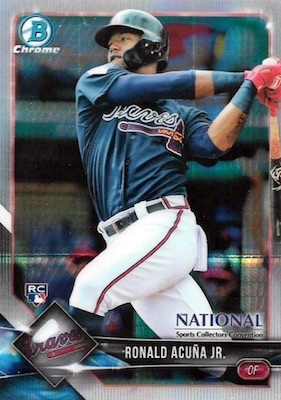 Using the 2018 Bowman Chrome design, the 2018 Bowman Chrome National Convention checklist is pretty simple with just a 50-card base set issued in four-card packs. This includes top current stars, rookies and prospects, plus past MLB legends. The main difference for the design is the added logo for "The National Sports Collectors Convention" above the player's name. Parallels include Gold, Orange, Red and Black Refractors. There are also autographs for 34 subjects that are randomly inserted into the packs. The signature lineup features Derek Jeter, Ken Griffey Jr., Mike Trout and Shohei Ohtani. 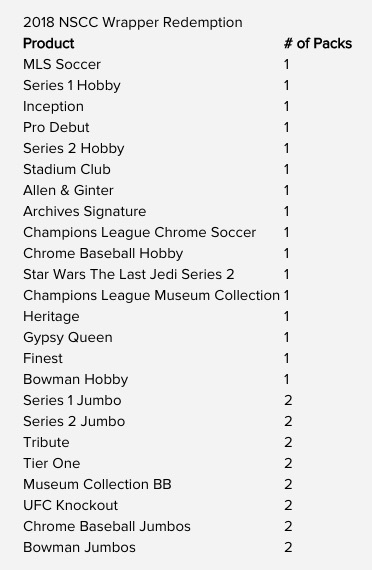 The following graphic covers the specific yield for each box of 2018 Topps or Bowman product purchased from an authorized retailer at the 2018 National. Every sealed 2018 Hobby box purchased and brought to the Topps booth earns either one or two 2018 Bowman Chrome National Convention Wrapper Redemption packs. Vendors provide you with a sticker that is used to redeem the packs. Only available as supplies last, the 2018 Topps NSCC promotion is limited to six boxes per person in each transaction. 50 cards. Buy on eBay. REFRACTOR PARALLELS: Gold #/50, Orange #/25, Red #/5, Black 1/1. 34 cards. Serial numbered. Buy on eBay. Base print runs noted when known. Let us know if you spot any others. REFRACTOR PARALLELS: Red #/5, Black 1/1.